Post-children years—the years that split my life into boxes. As I now unfold the flaps of that thirty-year block and rewind them, vivid memories come floating back through buried layers of subconscious soup. It was a place filled with juxtaposed emotions: tearful joy alongside aching sadness; thankful pride mixed together with profound heartache. A breathless journey down a steep mountainside, with five jerking precipices rising up (too quickly), marking the anticipated, yet dreaded, parting as each child left home, ripping out a vital piece of my heart. A wave of painful joy washed over me, a place of thankful mourning, as one gift of life from the sinews of my body, after another, moved away from needing me ever-present in their life. 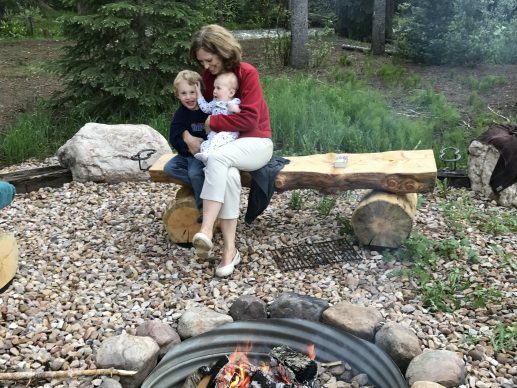 Although grateful for the freedom to sleep uninterrupted by nursing babies, wandering children, scary dreams, or teenage counseling, the body I had lived in comfortably for thirty years began behaving in strange and unpredictable ways. Post-reproductive years had been looked forward to as a comfortable, rhythmic place: without the cataclysmic upheavals of conceiving, growing, bearing, nursing, and swaddling (and the attendant three different sizes of clothes in my closet). Yet in this unfamiliar place, thermonuclear surges, deep within the core of my body, randomly turned on, or off, in the middle of the night leaving me inside a waterfall. Previously regular and manageable, I renamed what happened to my body every month as “Red Tide Days,” rendering me completely housebound. Facing these physical predicaments, I was reintroduced to a long forgotten insecurity about my physical body and faced tremors of deeply shaken confidence in losing my definition and purpose in life. I felt the long slow process of dying begin and I was way too young for this. There was new freedom there, stretching space and time with open possibilities where previously every second was crammed to overflowing, going in a myriad of directions. But I also faced an erratic fear of not being desperately and immediately needed, followed by near panic at the thought that this phase of joyous, hectic dependence—within which I could teach, lead, and influence those I loved the most—was just gone. What on earth, after all, had I taught them? Through the fog of pain, adjustment, and confusion penetrated gentle comfort. Essentially, I had taught them to rely on God, love fiercely, treasure blessings, and swallow life with an unquenchable thirst. Gradually an awakening sense of opportunity began to dawn, intimidating at first: freeing, then exhilarating. I had to decide where to turn (unencumbered, all by myself), what to do, how to go all over again, as I edged toward inviting yet terrifying new horizons. My basket of living filled up again with purposeful direction, in some ways even fuller than before, working toward goals which had been postponed for years. In teaching my children to follow their own path with love, I could also follow mine, without regrets, and thankfully, begin to look forward, not back.